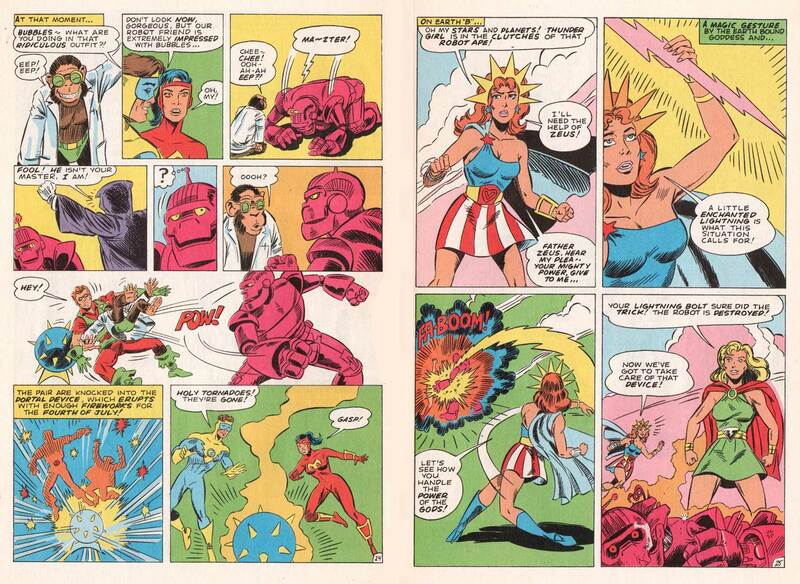 Big Bang Comics #6 was not a dream, not a hoax and not an imaginary story. It was worse – depending on your point of view – it was a reprint! That’s right. BB #6 was a reprint of our third issue from the Caliber Press mini-series two years earlier, from 1994. 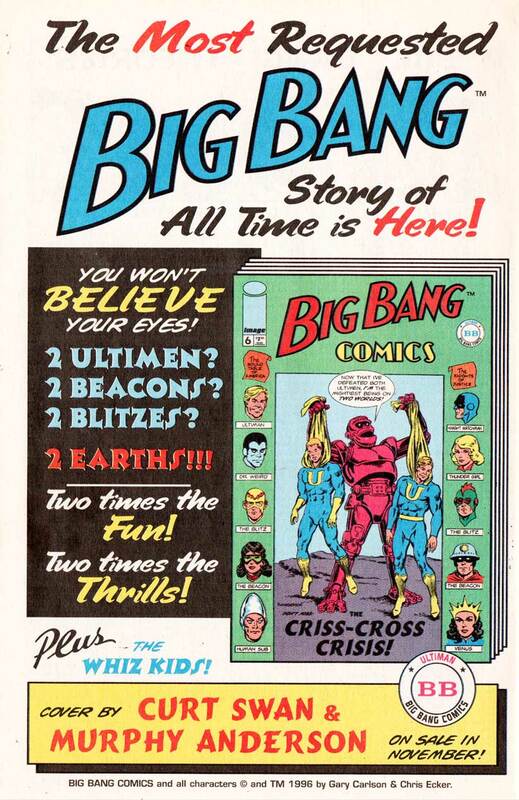 The ad for the issue on the last page of BB #5 said “The Most Requested Big Bang Story of All Time Is Here!” That was probably true at the time. The story in question, The Criss-Cross Crisis was certainly the most important one we had done to date. 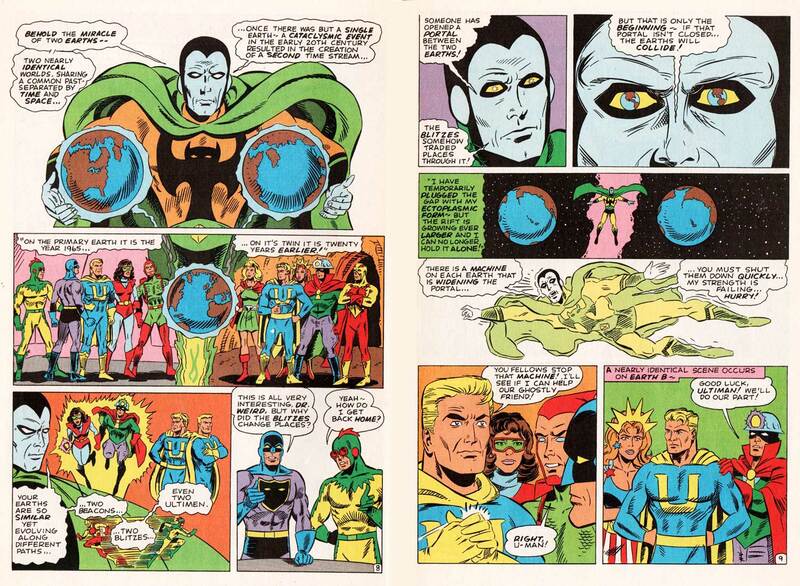 It established the Golden and Silver Age continuities on Earths A and B as co-existing 20 years apart. 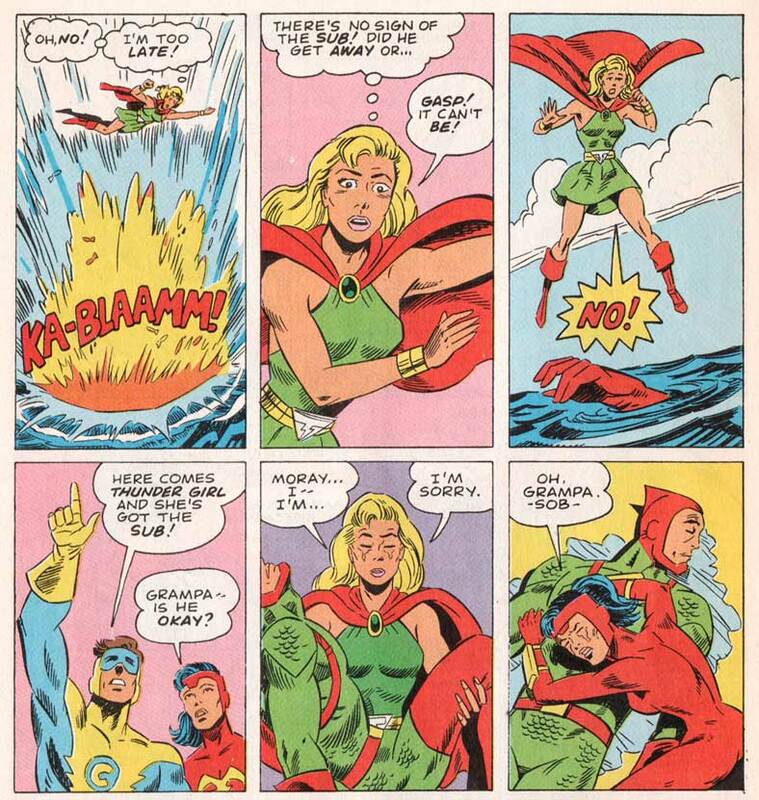 It brought Thunder Girl from the 1940s to the 1960s universe, introduced the Whiz Kids, the junior sidekicks of the Round Table of America, and it contained the death of a major character, the Atomic Sub. It was the only issue from the Caliber run that had completely sold out. We didn’t even have any comp copies left to sell to fans requesting back issues, now that we had a higher visibility at Image Comics. 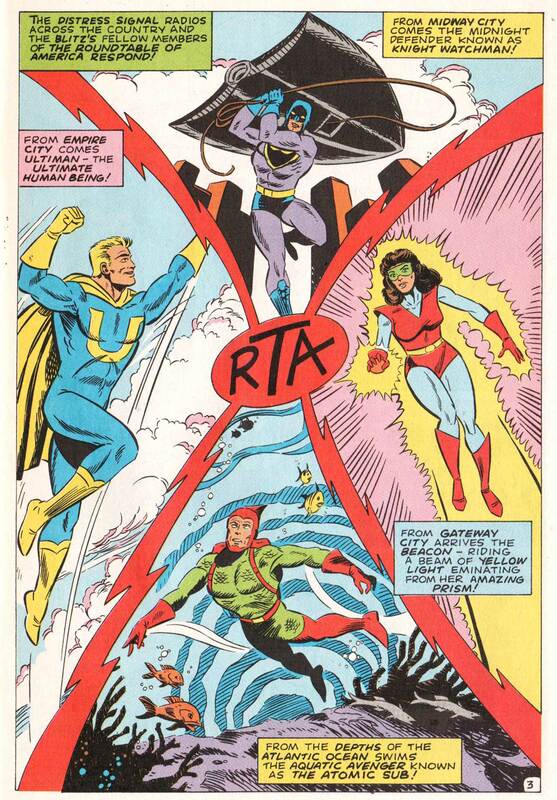 Oh yeah, it also had a great cover by Curt Swan and Murphy Anderson. Plus, we had the negatives to print from, saving us the 4 to 5 thousand dollars that we were spending on color separations per issue that we weren’t recouping. We knew that this was to be our last issue with color interiors for a while, so reprinting it made sense. I’ve already talked about the Caliber issue in an earlier blog (you can read all about it here: big-bang-chronological-pt-12). This time around, we only had to slightly recolor the front cover and slap the Image logo onto it, and come up with new inside front and back covers and a new outside back cover. As part of the new IFC, I printed a copy of Curt Swan’s original pencils. You can find that, and Chris Ecker’s original layout sketch in the previous blog. 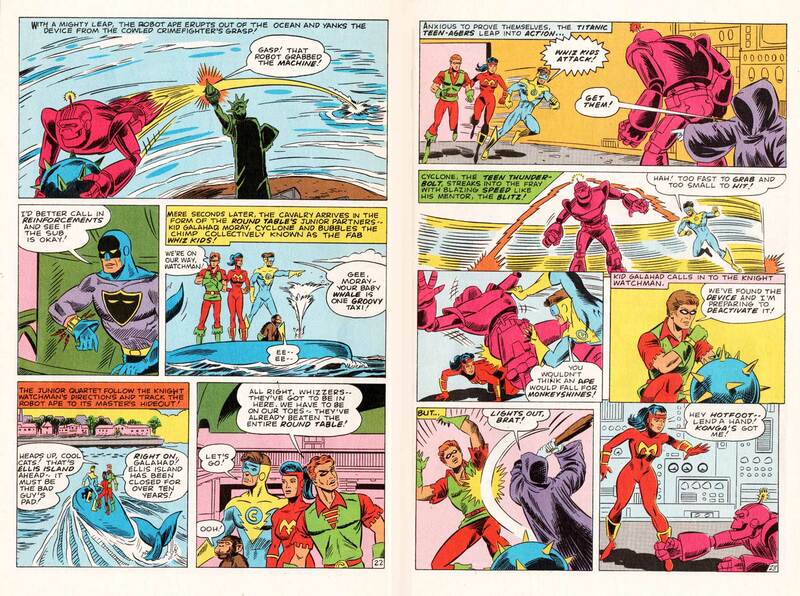 A letter column went on the IBC, and an ad for the all-new Big Bang #7 starring Mighty Man went on the back cover. The story itself was 32 pages and reprinted exactly as before from the original negatives. Easy as pie. I don’t recall anybody complaining about the reprint. I just thumbed through the letter columns for the following 3 or 4 issues and didn’t see any carping in those, so I can only hope everyone enjoyed it as much as we did. 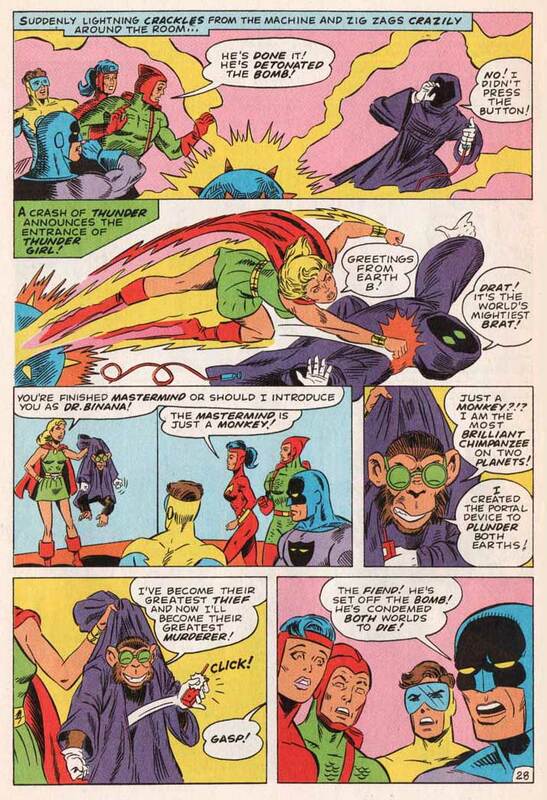 Since I told the background story about this one previously, I’m just going to let the artwork by penciler Steve Adams and inker Jim Brozman speak for itself.